PDF Connoisseur allows you to insert PDF pages into PDF Files. 1. Select a PDF file you’d want to insert certain PDF pages into. 2. Click “Insert” on the upper tool bar. 3. You will be brought to a window where you can specify the pages. 4. 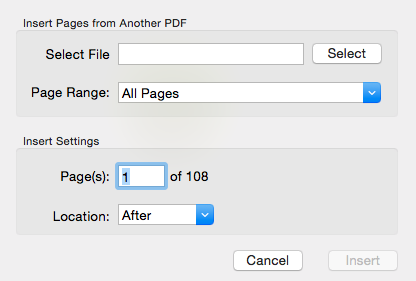 Select a PDF file and its containing page(s) that you’d want to insert into your PDF file. 5. Change your input settings. Specify the page where you want your certain PDF page(s) to be inserted into. Specify the location (After/Before) where you want the page(s) to fall at. 6. Click “Insert” to begin the process.